Joe Machens Mitsubishi wants to be your dedicated source for your next new or used car purchase, as well as a dealership you can always turn to for professional auto maintenance. Our dealership in Columbia, Missouri offers customized experiences for our customers, whether you are shopping for a new Mitsubishi or seeking quality parts or service for your current vehicle. Our staff of sales, finance, service and parts professionals is eager to assist you with your automotive needs, and you can rest assured that our prices are always competitive! If you have your eye on a new Mitsubishi Eclipse Cross or a used car, SUV or pickup of another make, do not hesitate to shop and secure your next ride on our website or with a visit to our dealership. Drivers from nearby Jefferson City and Fulton, MO can always count on Joe Machens Mitsubishi for a superb selection of affordably-priced vehicles for sale, plus financing assistance to make your purchase hassle-free. From our tire service, oil change and other routine maintenance services to our genuine Mitsubishi parts for sale, we have Columbia, MO area Mitsubishi drivers covered. For a joyful driving experience, visit Joe Machens Mitsubishi! Mitsubishi offers an impressive lineup of competitively-priced cars and crossover SUVs for sale, all of which can be found right here at Joe Machens Mitsubishi. 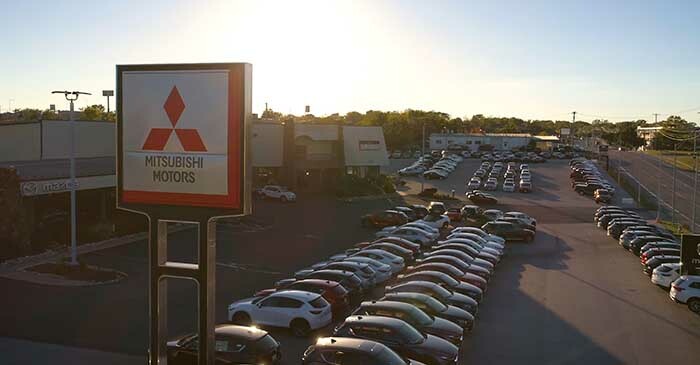 We invite car buyers from nearby Fulton, MO to shop and compare our range of new Mitsubishi vehicles here on our website, then visit us in Columbia for a closer look and a test drive! If you have not found that ideal new Mitsubishi in our current inventory, then do not hesitate to contact our sales staff or use our vehicle finder form. Discover the value and versatility in a new Mitsubishi Outlander or Outlander Sport today! At Joe Machens Mitsubishi, we want to make your entire shopping experience hassle-free -- and that goes for the financing or leasing process, too! Whether you decide to buy or lease a new Mitsubishi or finance a pre-owned one, our staff is here to assist with the paperwork and fine print. You can apply for new and used car loans online right now, as well as use our handy payment calculator and trade-in appraisal tools. Drivers with less than perfect credit are invited to apply for loans as well! When the time comes for new replacement parts or some styling or protection accessories for your Mitsubishi, turn to the parts department at Joe Machens Mitsubishi. We carry the genuine Mitsubishi items your Lancer or Outlander deserves, all at affordable prices. Contact our parts specialists when you are in search of wiper blades, floor mats, filters or a new battery for your Mitsubishi, and our team will provide you with cost-effective options. You can request your Mitsubishi parts online right now! When you are looking to save money on your next car purchase, consider one of the quality, late-model used cars, SUVs and pickups here at Joe Machens Mitsubishi. Here, you will find a large collection of used and certified pre-owned (CPO) Mitsubishi vehicles, along with used cars of other makes. Just like with a new Mitsubishi, our CPO Mitsubishi models come backed with a stellar factory warranty and the peace of mind you seek. Explore our used car specials online now or plan your visit for that test drive! Our used car lot is just a short drive from nearby Jefferson City. 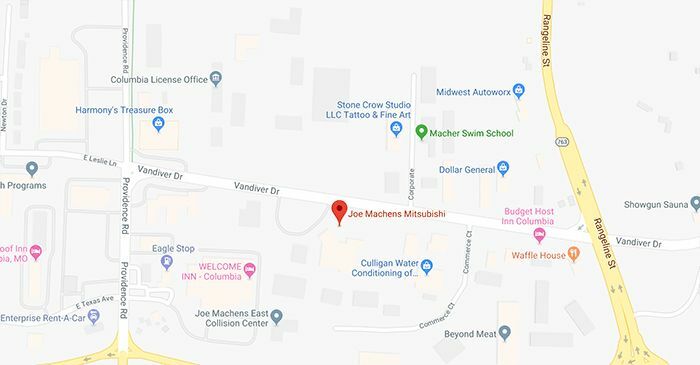 The Joe Machens Mitsubishi service center welcomes drivers of many makes to visit for professional auto maintenance and repairs. We employ Mitsubishi factory-trained and ASE Certified technicians as well as knowledgeable service advisors to help ensure that your maintenance visit is prompt and professional. Go ahead and schedule a service appointment online now for your upcoming visit, whether that be for a quick oil change, brake inspection or tire service. Joe Machens Mitsubishi is Columbia, Missouri's dedicated Mitsubishi dealer and proudly caters to our neighbors from nearby Jefferson City and Fulton with a whole host of automotive services. You can explore our dealership through our website, where you can not only shop our new and used car specials, but also see what your car is worth as a trade, apply for financing and so much more. Our sales, finance, service and parts staff are committed to excellence, so shop Joe Machens Mitsubishi today.